If you have a patio, you likely enjoy using it to sit out under the sun, catch some rays, or entertain guests. Patios are a great space for you to relax, sip a cool drink, and talk with friends. What your patio may need is some top rated outdoor chairs for you to relax the day away. Patio chairs are an excellent investment if you want to change the look of your patio and upgrade to smooth, sleek, and durable patio furniture, patio chairs are a great first step at achieving a beautiful entertainment space. There are many different types of porch chairs from rockers, recliners, all-weather, and sets with a table. No matter what you prefer or need, you should be able to find a patio chair design that suits your need! The best patio chairs will be comfortable and durable to ensure that you can relax throughout the seasons, all from the safety of your private patio. We know it can be overwhelming to choose from all the patio chair designs, so we’ve made a guide to help you choose the best, so you can put your feet up faster. This outdoor chair and table set is ready to assemble and included detailed assembly instructions. 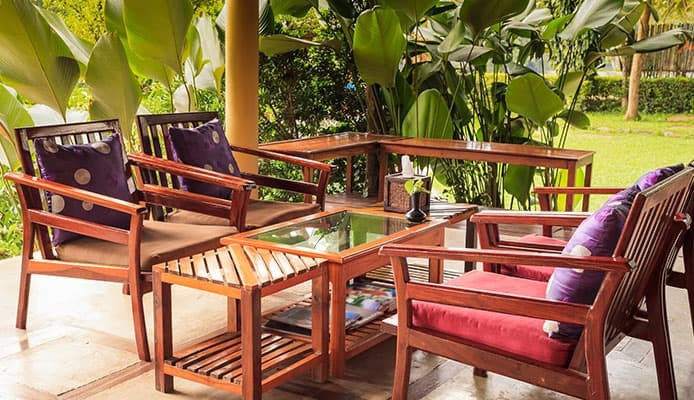 They have a molded rattan design that is more durable and comfortable than woven rattan. It is made out of polypropylene for resin that is exceptionally durable, rust-proof, and all weather. It is lightweight and has sturdy metal in the chair legs and table base. The entire set can be easily cleaned and can be used on a deck, pool, or any location in your backyard. Keter ensures that you can have perfect outdoor living. These lounge chairs are sturdy and UV resistant. They have a 250 pound weight capacity with a UV resistant mesh that is designed to last outdoors. It has a smooth lockable reclining system that can offer a zero-gravity position. The elastic cords are easily replaceable and immediately adjust to your body. There is a convenient cup holder tray for drinks, magazines, phones, and other small objects. It has removeable headrests for added comfort. It is foldable and portable for lightweight and easy transportation. This design has a durable textaline fabric that is suspended by a double bungee system. 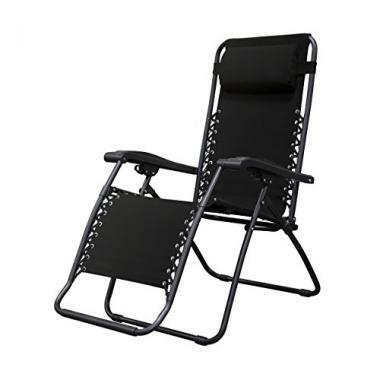 It has a relaxing and smooth recline with a locking position. There is an adjustable headrest and lumbar support pieces. It has a dual finger locking tip system and it folds down to only 6.3 inches wide. It has a strong steel frame and can support up to 300 pounds. Patio chairs reviews give this design a reliable 4-stars. This is a beautiful outdoor and all weather wicker bistro set. It has a black synthetic resin with a wicket design. It is also UV resistant. It has comfortable rocking chairs that are cushioned for maximum comfort. The bottom cushions have a removable cover for easy washing. There is an elegant glass top table that is the perfect size for a few drinks. The set is durable, comfortable, and strong. The framing provides extra support and balance. It can be quickly and easily assembled with the provided instructions. 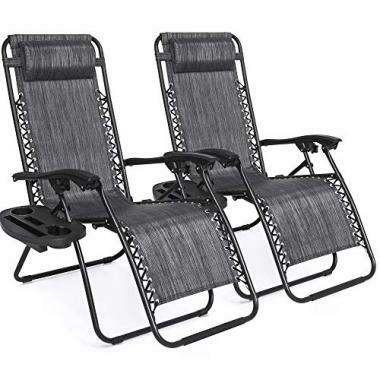 Patio chairs reviews call this an “overall great product”. This has a classic but comfortable design. It is made of a weather-resistant simulated wood that is UV protected. It will not crack, chip, or peel. It is also stain resistant and easy to clean. Some assembly is required. With Lifetime’s design, you can get the beauty of wood without the maintenance. This chair has a durable textaline fabric that is suspended by a double bungee system. It can support 300 pounds and has high strength steel. A durable iron phosphate power coating gives it rust protection. It has long lasting outdoor grade fabric in the design. 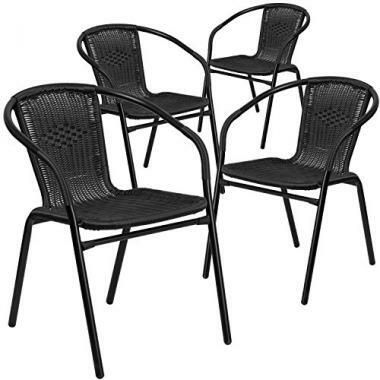 This set of 4 outdoor chairs is stackable up to 23 chairs high. The chairs have a café style with a curved back. It is made of black rattan on the seat and back. There are integrated arms. Cross braces give it extra stability and a powder coated frame finish ensures it is rust resistant. It can easily glide across the floor with their lightweight design. They are suitable for indoor and outdoor use. This chair has an all weather construction. It has a wicker style that requires zero maintenance. An outdoor cushion is included for comfort. It is easy to assemble and lightweight for fast mobility. With Patio Sense’s design, you get year-round relaxation. This patio chair is easy to maintain and is made of an all weather resin. It has a comfortable seat with convenient storage space with an 11 gallon capacity. 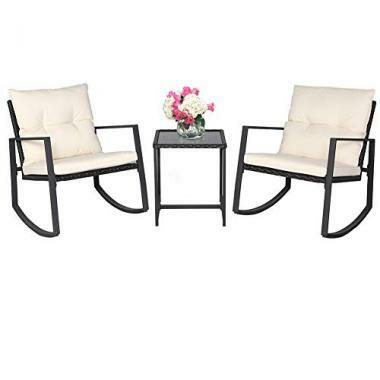 It is durable but lightweight and can be easily rearranged on your patio. 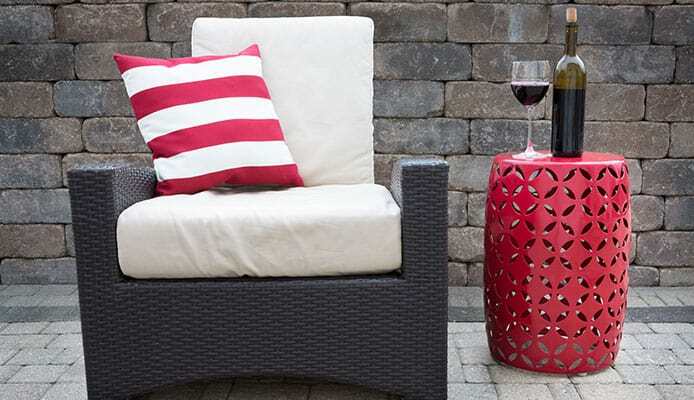 It has a seat cushion and can hold your other patio accessories. This set of dining chairs are made of cast aluminum and have some assembly required. The Covington design brings luxury and convenience to your outdoor space. They are durable and high quality with a mesh back and seat rest. They will hold up in any weather condition and can be used in your backyard, patio, or deck. 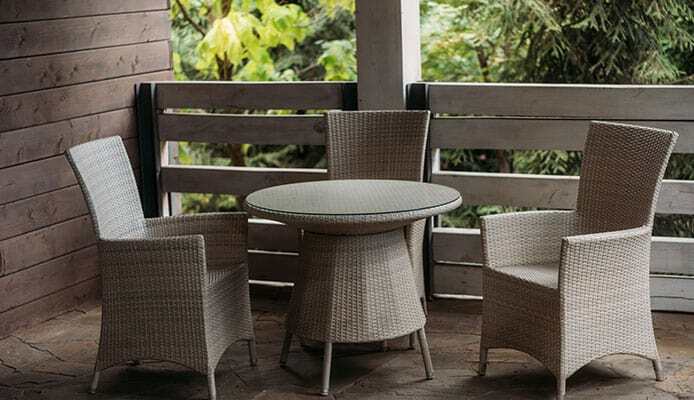 When it comes to choosing a set or multiple patio chair, it is important to consider a few key features before making a purchase. There are many different types of patio chairs that all have their own designs and features that make them unique. Plus, they all have different names from lawn chairs to garden chairs and deck chairs, which can make it confusing to choose a design. You should consider the durability of your patio chairs and what seasons you wish to use them. Most people will want summer chairs and should consider having or investing in a few other features like patio umbrellas and waterproofing sprays to ensure their chairs are up for the job. If you are looking to lounge in cooler weather, consider investing in patio heaters to keep you and your guests warm. The best outdoor chairs can be used in any season and any time you want. By spending the time to find a set of top rated outdoor chairs, you will be happier for longer. One of the most important features that you should consider is the comfort of your chair while you are using it. It would be frustrating to invest in patio furniture that you dislike or can’t feel comfortable using. There are many different designs of patio chairs from lawn chairs, poolside chairs, lounge chairs, and even folding patio chairs. No matter which one you choose, you should feel relaxed and comfortable when you at sitting in the chair. A factor that will greatly affect whether your patio chair is comfortable will be the style and design. Some chairs have a straight back that makes you sit upright, and other chairs will have an angled backrest to let you lean a little. Other chairs, like lounge chairs will allow you to lay down flat or sit because they will have a fully adjustable backrest. You should also consider if your patio furniture comes with any padding or cushions for the seat of your chair. A cushion can raise you off of the chair and make a soft area for you to sit on. Patio chairs come in many different types of materials and most of them are hard and durable. Size is important because you want to have a chair that is large enough that you feel comfortable but doesn’t take up all the space of your patio. The best patio chairs will come in a variety of sizes, so that you have the ability to choose what best suits your needs. Patio chairs can be wide, narrow, short and tall. If you are looking for lounge chairs, they will likely be longer, so that you can fully stretch out. There really is an abundance of patio chairs in all sizes. It will be up to you to decide if you feel more comfortable with a wider chair or if you like a narrow chair to feel cozy. However, another size consideration that’s important is the actual size of your patio. It is rare that someone buys one patio chair. Normally, they are purchased in pairs or sets. This means that you will have to fit 2 chairs or more on your patio. You want the chairs to be comfortable for you, but comfort also means being able to move around your patio without a hassle. You will want to ensure that your patio chairs leave enough space for you to pass by or walk around them. Especially, if your patio chairs come in a set with a table, you want to ensure that your patio is large enough for all the outdoor patio furniture pieces. A patio that has appropriate spacing with all the deck chairs will look more attractive and have you walking around comfortably and with ease. If you are tight on space, consider folding patio chairs for an easy way to save space. Durability is an extremely important feature that you should consider before purchasing porch chairs. 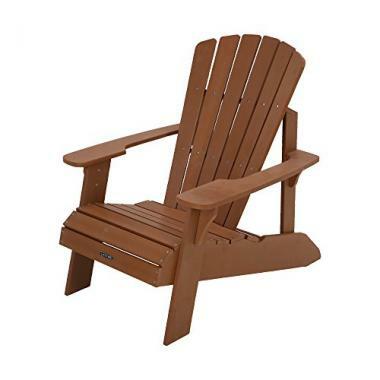 Top rated outdoor chairs will be extremely durable. Patio chairs need to be durable because they are exposed to all types of weather. You likely will use your patio chairs in warmer seasons, but that doesn’t mean they still don’t need to be durable. The sun is harsh and constant exposure to its rays can, over time, break down material. Rain or hail can also occur and that can beat down the material of a patio chair. The best you can do is to invest in durability and properly maintain your patio chairs to ensure that they will last you throughout the years. You should also consider the difference between water resistant versus waterproof. Patio chairs that are waterproof are more durable and further, longer lasting than water resistant. There are a lot of different materials that can be used to construct patio chairs. The most durable materials are metal, plastic, and wood. All three of those materials give a different look to your patio, but all should be able to withstand tough weather and the sun’s rays. 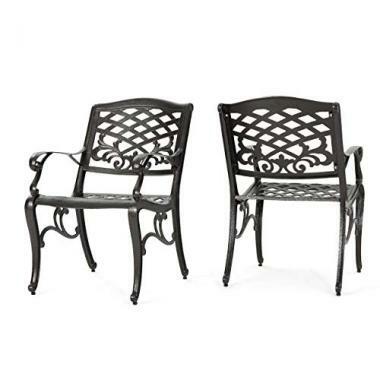 Metal: Metals that are commonly used for patio furniture is wrought iron or aluminum. Wrought iron and aluminum are both very sturdy metals. Wrought iron would be heavier and aluminum would be the most lightweight option. Metal can make for a modern looking patio and it is an easy to clean material. If you live in humid locations, you’ll want to invest in wrought iron or aluminum over other metals because of their durability with exposure to constant moisture. Plastic: Plastic is a lightweight but durable material, that can be easily cleaned and can withstand a rainstorm. However, plastic can be prone to breaking under hail like conditions and it can fade quickly under the harsh sun. However, if you plan on moving your patio chairs in and out of storage, plastic would be an easy option that can be easily maneuvered. Plastic may not be the most attractive look for your patio, but it certainly is durable in humid and salty air conditions. Wood: Wood offers a classic and clean look. It can be heavy but is normally not heavier than metal. Wood that has be properly sealed, can be extremely durable to withstand the weather conditions, humidity, and salty air. The finish of the wood may fade quickly under the sun and require new treatments to ensure it stays sealed, dry, and beautiful. Like durability, sturdiness is also important. Durability is more related to how the summer chairs are able to withstand constant use and weather in the outdoor elements without disintegrating or breaking down. Durability is more related to the length of time that the patio furniture lasts without complications. On the other hand, sturdiness is more about how strong the patio chair is to hold the weight of a person and also withstand constantly being moved. You want to ensure that when you sit in the lounge chairs, you feel secure that they won’t move or collapse or shift. Once you sit in your deck chairs, it should be hard to move the piece of furniture. Your weight should be stably held without a wobble or precarious balance. 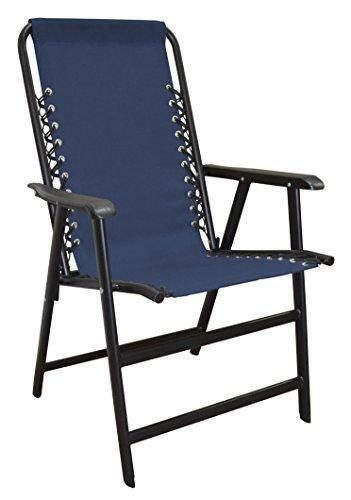 Top rated outdoor chairs be stable and durable. 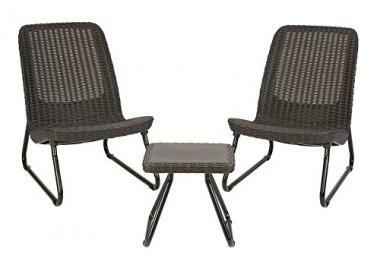 As mentioned in materials, the different types of patio chairs will all have different weights. Metal and wood are the heaviest materials, but aluminum can be as lightweight as plastic. If you are going to be moving your patio furniture a lot, you may want to consider the lightest material to make it easier for you. However, if your garden chairs will stay in their place throughout the season, it may not be a hassle to move a heavier object less times. Heavier chairs tend to be sturdier and have a higher weight capacity. You should also consider the location of your patio in regard to your safety. If you are facing windier weather elements, heavier patio chairs will be more secure. It would be dangerous to have the wind lift and throw a patio chair around. By investing in a heavier patio chair, they are less likely to be lifted or damaged by the wind. Q: What is a patio chair? A: A patio chair is a piece of patio furniture that is used for leisure or comfort. Patio chairs come in a variety of styles and designs. Most patio chairs are used on outdoor patios, but some may be used for indoor patios too. They have durable designs that can withstand exposure to wind, rain, snow, and sun. Patio chairs are used to make an outdoor space comfortable for people to enjoy and relax. Patio chairs offer a space where people can relax, connect, sip a cold drink, or warm up around a toasty fire. Patio chairs can be used at any time of the day and in any locations. There are garden chairs, deck chairs, and poolside chairs to ensure you get the most out of your backyard space. Q: How to make my patio chairs more durable? A: There really isn’t a way to make patio chairs more durable, which is why it’s important you spend the time to find and invest in durability. Patio chairs need to be constructed to be durable because you can’t reconstruct or rebuild the patio furniture. The only way you could help the durability of your patio furniture would be to use waterproofing sprays or apply an anti-corrosive solution. If your patio chairs come with any pillows or cushions that have a fabric cover, you can use a waterproofing spray to keep them from becoming water logged in a rainstorm. A waterproofing spray won’t actually help the actual patio chair because the material of the chair should be able to get wet and then be dried. However, an anti-corrosive solution could be applied to a metal patio chair to ensure that it does not rust or breakdown. For wood, it’s best to keep up with the finishing layer. Plastic itself is anti-corrosive and waterproof. While you can you sprays to boost certain aspects of your patio chairs and their accessories, it won’t make a flimsy chair durable. The best patio chairs will be made and sold durable. Q: How to clean and maintain my patio chairs? A: The best way to clean your patio chairs is to follow the manufacturer’s instructions or provided guide. If your patio chairs came with an information booklet or guide, there should be instructions on the best way to clean them. However, all patio chairs should be able to be safely cleaned with water. You can spray your patio chairs down with a hose to remove any dirt, dust, or sand. If you have any pillows or cushions or fabric covers, they should be removed before you washed the chair. For pillows, cushions, or fabric covers they should have their own label that explains their washing instructions. Most pillows and cushions are better being hand washed and not placed into a washing machine. A fabric cover may or may not be able to be placed into a washing machine. The best way to maintain your patio chairs is to keep them clean and keep them out of the sun, rain, wind, or hail. Top rated patio chairs should be durable enough to withstand the elements, but that doesn’t mean you can’t take steps to make them last longer. If you store your patio furniture when not in use, it’ll be longer lasting. At the bare minimum, you should always store any fabric accessories after each time they are used. Your patio chairs may be okay in the shade and with a few rainstorms, but pillows and cushions are better off without being exposed to a lot of water. Patio chairs are a great addition to your backyard space. 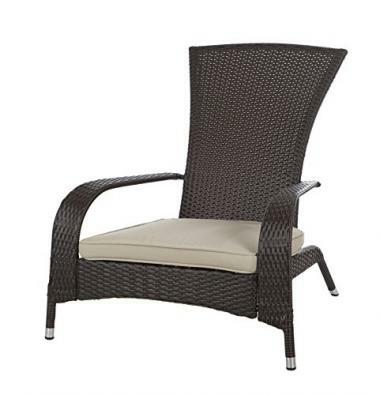 With a comfortable patio chair, you can relax or entertain guests. As well, patio chairs can make your patio stand out and transform the feel of your patio. The best patio chairs will be both functional, fashionable, and be easily added to your existing patio furniture. They can boost your patio from boring to thriving. If you know exactly what you want or need, you can save time and money by investing in top rated outdoor chairs! 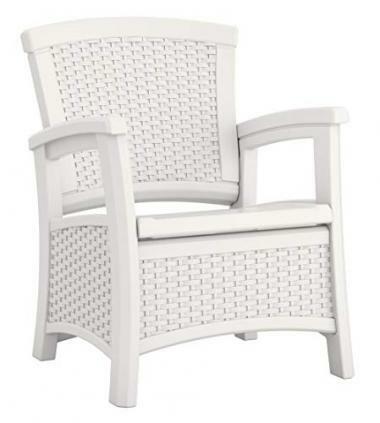 Do you own some of the patio chairs that have made it onto our list? Let us know how it has worked for your patio needs in the comments section below.